This book will introduce you to yourself. Despite what you may have been told when you were a child, you cannot be whatever you want to be in life -- you are already what you were meant to be. 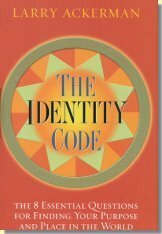 The secret to uncovering who you are, and your purpose, is built into you in the form of a code -- the identity code. Much like your genetic code, your identity code provides a complete map of how you were designed to live. Answer the questions that frame the identity code, and the contours of your life will shift. You will not only emerge stronger, you will emerge larger. Larger in heart, larger in influence, larger in your capacity to love and be loved. You will understand the why of your life. Define yourself as separate from all others. Is there a pattern to my life? Make the connections that explain past events and foreshadow your future. Commit yourself to the path revealed in what you've learned so far. Follow the signs of joy. Take stock of who matters and why. Declare yourself on the strength of your gift. Will my life be rich? Surrender to the pull of identity. As Ackerman points out, unbridled freedom actually weighs you down. The myth of personal freedom -- the notion that you have infinite choices in the course you set for yourself -- is the unspoken agony of the modern person. True freedom comes with knowing your identity: the unique characteristics that define your potential for creating value in the world, for making a contribution that springs naturally from the core of your being and touches the lives of others. Within this framework, life's seeming boundaries melt away. Intelligent, provocative, and always practical, The Identity Code sets the reader on the classic quest: the discovery of self. Take the journey.